Egypt Scott holds salmon as Marsalis Boyd takes a turn slicing salmon into filets as Melanie Ronen hold the fish at Wissahickon Charter School. Some visitors were coming to the cooking class at Wissahickon Charter School Awbury campus in Germantown last week to witness the My Daughter’s Kitchen program up close and to consider financially supporting the program. As anyone who has ever taught a class of children knows, there are a million things that can go wrong, and even if everything runs according to plan, some classes fall flat. Also, in an after-school class, I am never quite certain whether students have a conflict that day, have transportation issues, or just might not be in school. Finally, there are the challenges of preparing a recipe in the cafeteria kitchen with a powerful industrial oven — which must be adjusted for time and temperature so it doesn’t incinerate the dish — and a range that tends to shut off when the flame is turned down to simmer. So, it should be said that fingers were crossed as I began setting up the prep area to make salmon in spinach and cream, this week’s example of a dinner than can feed a family of six for $20. 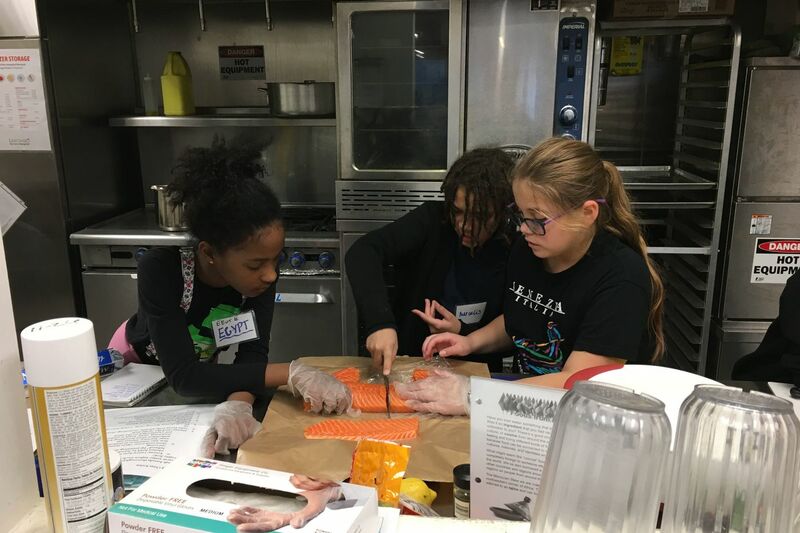 This semester, there are 65 volunteers teaching healthy cooking classes at 32 urban schools throughout the region as part of My Daughter’s Kitchen, and all of them know how wonderful and rewarding the classes can be; it’s what keeps so many volunteers continuing. Fifty of the volunteers are returning; some have been with the program since its inception five years ago. But could one single class convey its magic to outsiders? We were about to find out. For starters, all the kids at Awbury were in attendance. And though any fish can be a hard sell to children, at least two of the Awbury kids had eaten salmon before and liked it. That was a better ratio than in the other participating schools in Philadelphia and Camden, where only a handful of the 160 children had ever tasted salmon before, and many were not eager to try it. But it seems even when these students are not excited about the finished meal, they are still interested in the process. And that process can be transformative, with some of that reluctance turning into curiosity, as happened last week, as the students cut the salmon into filets, grated the lemon, diced the shallots, and measured tarragon, a new herb for many of them. It beautifully demonstrated how seeing and touching and smelling wonderful, fresh ingredients can change perceptions. All the students enjoyed the arts and crafts aspect of assembling all the ingredients into foil packets. At Awbury, the students took ownership, each creating one — “Mine looks beautiful,” admired Egypt Scott” — and marking their initials with a Sharpie on the outside, saving enough ingredients for each of our guests to assemble one. Work stations all ready for making Moroccan stew at Wissahickon Charter School, Awbury campus. At Bayard Taylor School in North Philadelphia, where volunteer Peter Landry wrote that the students were not sure they would like the salmon or spinach or cream, all the kids were impressed with how colorful the foods looked when assembled. Some, like Brittanye Vasquez, couldn’t wait to try them. “I want to eat this right now,” she said, bending over to smell the tarragon and lemon zest on top of her fish. “It looks like a spring garden!” said Joseph Alejandro, admiring his assembled ingredients at Robert Pollock School in the Northeast. There was much interest in how all these ingredients would come together in those foil tents, and ultimately some very happy eaters. “This is amazing!” exclaimed Calvin Johnson at Hunter Elementary in North Philadelphia. “Oh, my gosh, it’s delicious, so many good flavors,” echoed Yadiel Ruiz, who was enjoying it so much he didn’t even notice he had salmon cream running down his chin until his friend Calvin kindly reminded him to use his napkin. “The kids LOVED it,” wrote volunteer Jim Zaccario at Blessed Trinity in Tacony. “Only one student had tried salmon before, but they all really loved it and finished their plates.” He reported that two of his students’ families were planning to make the dish in the next week. At Awbury, the room where we normally eat had been overtaken by a very loud drumming class, background music that would not be most conducive to conversation. But the kids weren’t fazed. They spread the tablecloth on a table outside and we made a picnic on the unseasonably warm day, which, somehow made the opening of their packets even more exciting. I was just as proud of the students who did not rave but who demonstrated lovely table manners. Melanie Ronan said she preferred the way her mother made salmon, with soy sauce; Egypt Scott commented how good the cream sauce made the quinoa taste; Marsalis Boyd wrote he liked that the salmon was smooth but thought it had no flavor. But even more than that, I was so proud to see the kids step up to the dish detail. Without even any prodding, Suriyah asked me, “Will you do the soapy water in the sink?’ And then they staffed their stations at the double sink, washing, rinsing, and drying, until all the work was done. I took a deep breath. The kids showed up and were engaged, the recipe worked, the students were flexible about where to eat. They were gracious and thoughtful at the table and took responsibility for clean-up. And the visitors saw the magic happen. Contact Maureen Fitzgerald at mydaughterskitchen@gmail.com. For previous stories, go to philly.com/mydaughterskitchen. Salmon in spinach and cream gets prepped in its foil packet. 1. Preheat the oven to 425 with a rack in the middle position. 2. In a large bowl, combine the spinach and shallots, and then season with salt and pepper. Lay the spinach mixture among the pieces of foil (allowing enough foil so the pieces can be folded into packets) mounding it in the center in the general shape of the salmon fillets. 3. Lightly season the salmon with salt and pepper, then put it on top of the spinach, skin side down. Sprinkle each piece of salmon with lemon zest and tarragon. 4. Then bring up the sides of the foil to create a bowl. Pour ¼ cup cream into the bottom of each packet. Leaving an air pocket over the salmon, fold together the edges of the foil along the top and both sides, sealing tightly. 6. Meanwhile, make the quinoa. Bring 2 cups of water to boil in a medium pan. When the water boils, add the quinoa and turn the heat down to low. Cover and simmer until all the liquid is absorbed, about 15 minutes. Then use a fork to fluff and separate the grains. 7. Transfer the packets to plates and serve, spooning ½ cup quinoa into each packet.